The new bed was my choice – our last house was very modernist and sharp, with lots of right angles and brown leather chairs and sleek mirrors and dark tiling, this house (old, handsome, mostly painted in varying shades of off-white) is a lot softer. I wanted something a bit more luxurious, something with a touch – just a hint, a distant echo! – of fairytale princess. I still love mid century furniture and lighting and aesthetics, but I feel as though I can play about more with different styles in this house. 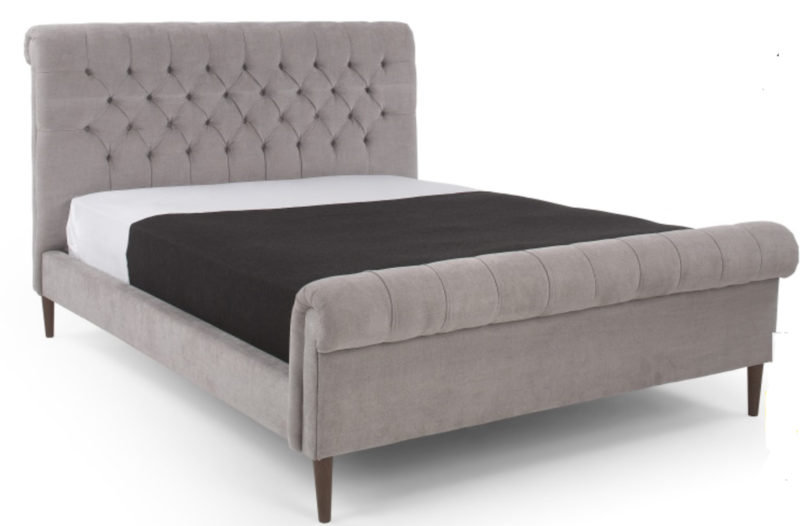 It took me absolutely ages to choose a bed, but in the end I went for the Orkney from made.com (pictured below) because I liked its simplicity and elegant lines. It’s classic, unfussy and chic but the fabric gives it a certain softness and the buttoned headboard is a nod to a more traditional style of furniture. It’s not in the least princessy, but it’s definitely more romantic-looking than the boxy wooden one with the telly in the end! You can find the Orkney here* from £749 – I had a voucher code, you can sometimes find these online or on the London Underground on posters and so on. Worth hunting around for if it’s a big purchase! There are a few different fabric choices, including a beautiful deep grey velvet and (although not in superking size) a lovely pale blush. 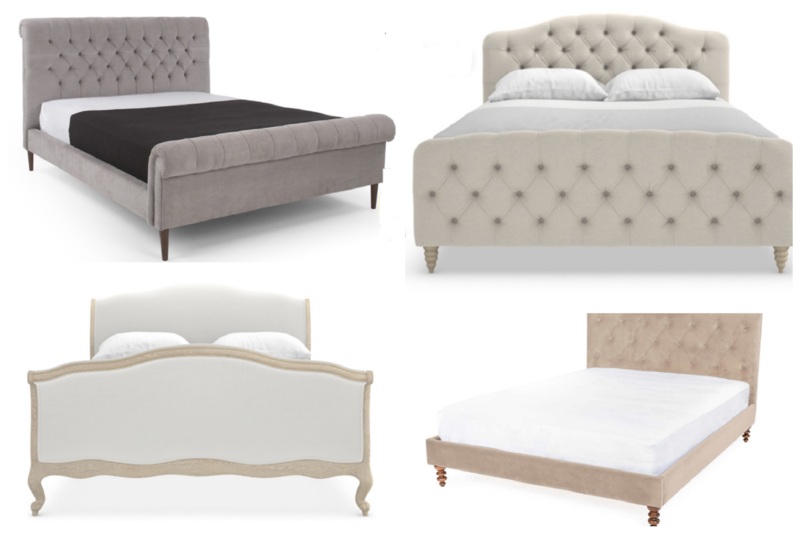 The Balmoral bed from Heals was a strong contender for Best New Bed Option; I loved the classic headboard and the turned legs. But then on the other hand, the turned legs were perhaps slightly too traditional to go with the chests of drawers we have – we’re still very firmly modern in this house, despite the layers and layers of white cornicing that makes it feel as though you’re living inside a wedding cake, and the ornate fireplaces. In the end the Orkney won because the legs were so simple – but also because there was an end to the bed, which made it feel more neat and finished. In reality, having an end to the bed actually makes it really difficult to arrange your duvet nicely, because usually you let it hang over the end of the mattress but in this case it has nowhere to go. So: swings and roundabouts, my friends! 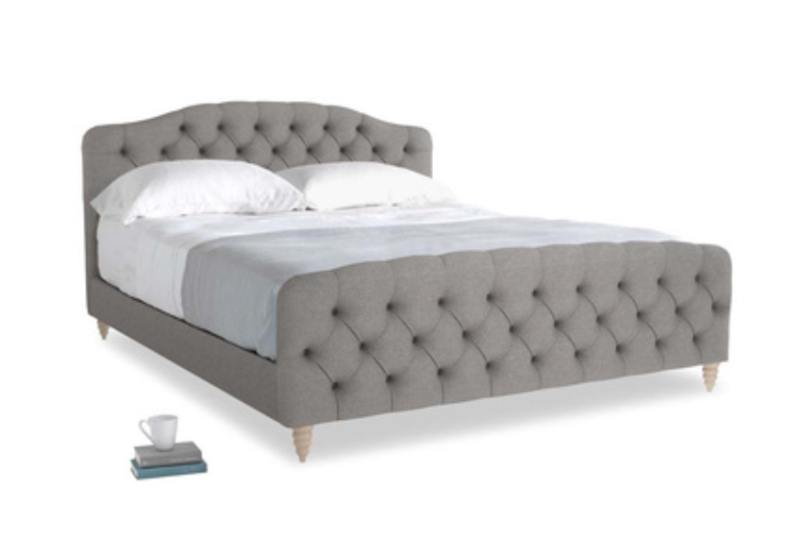 You can find the Balmoral at Heals here* – it starts at £1249 and comes in eight fabric options. Until Sunday there’s a 10% code running on their homepage – HEALS10. 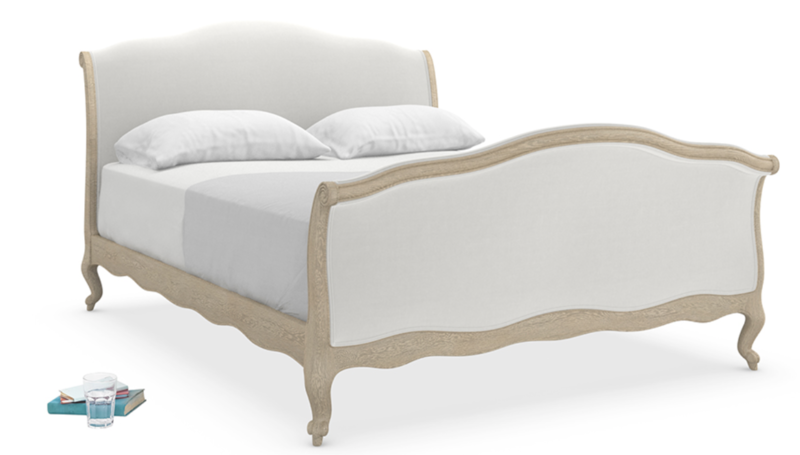 I was seriously drawn to the Antoinette bed from Loaf, above; it’s really very pretty. The shape is so gorgeous and you can pick from around twelve billion different fabrics to upholster the head and foot boards in, which I found both appealing and off-putting all at the same time. Because if it takes me days and days to choose between a few beds, how long would it take me to choose between twelve billion (actually 151, but still) fabrics? Years! I’d still be sleeping on the mattress! In the end, the weathered oak look was just going too far down the wrong interiors route for us. They also do it in a sort of vintage grey finish, which is a tempting option for my “studio room” I’m creating (a sort of room set to film in – it’s a work in progress, I’ll post about it soon) but I’m still dithering over that. Also at Loaf, the Squidgel bed, pictured above. A bed I would have bought for the name alone, had the foot of it not looked like a giant Bourbon Cream. Come on! Tell me you don’t think the same? It’s a big Bourbon biscuit stuck on the end! (They don’t actually do a brown fabric for this bed – I just tried to mock up a picture for you to prove the Bourbon theory but the closest I could get to it was orange velvet.) 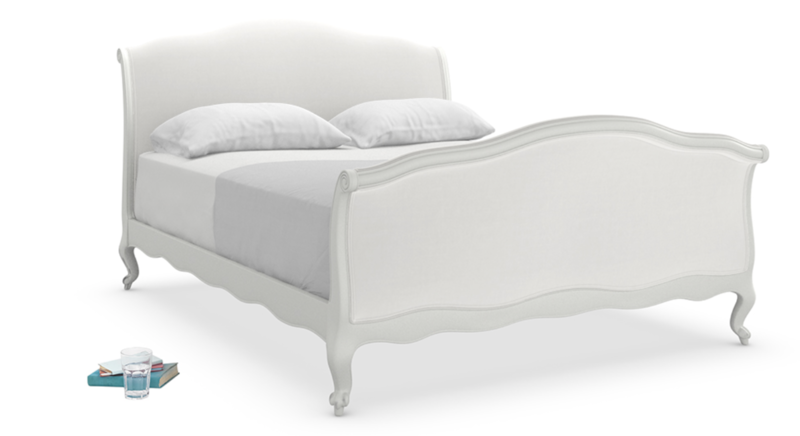 Despite the biscuit issue, I was seconds away from buying this bed – it was in the basket, fabric (pale grey) chosen and credit card details entered. It just looks so cosy, so comfy, as though you’d sink into it and possibly never manage to climb back out. And surely that is what a bed is all about? I think that Loaf have got the whole comfy, squidgy thing totally coined – good brand name, good product names and the sort of plushy, bouncy upholstery that you could lose small children in. And now to And So To Bed, who have the most sumptuous, luxurious array of bedsteads you could wish for. Princess beds, beds fit for a King, beds that you can imagine Mariah Carey sleeping in, beds so big they could possibly double up as an actual house if you just slung a waterproof groundsheet over the top and connected it to the gas and electricity… There seems to be a sale on, which irks me greatly because at the time I needed to order a bed there was no sale. 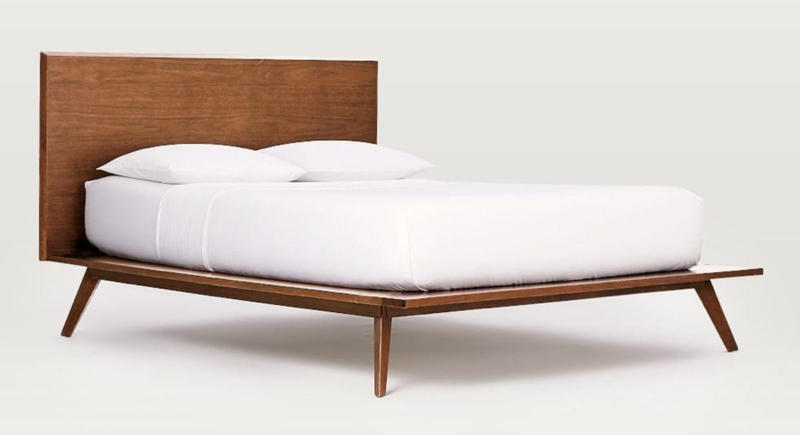 But good news if you’re currently on the hunt and have a bit more to spend than average – these are seriously-priced beds-for-life. 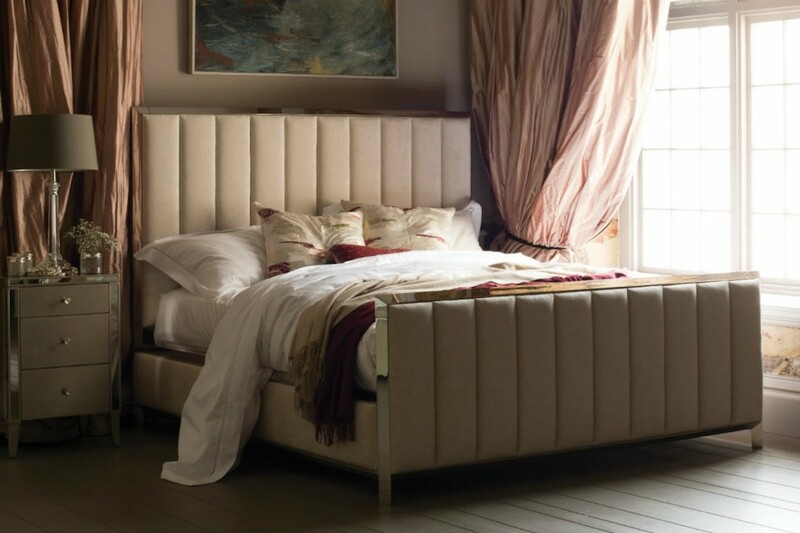 I like the Pimlico, above, with its amazing metal trim – this looks like something from a Tom Ford shoot – and the Churchill bed, which almost seems to embrace the mattress with its semi-closed-in feel. The Pimlico is currently £2725 instead of £5450 – I don’t even want to write the price of the Churchill down, but you can ogle at it and make it up in your fantasy fabric here. Yes, you would probably take a chunk out of your shin-bones every time you passed by those sharp corners, but wouldn’t it be worth it to feel ultra-cool, swanning about wearing a pair of crisp white pyjamas, drinking coffee from something Scandinavian-looking and calling yourself, I don’t know, Sven. 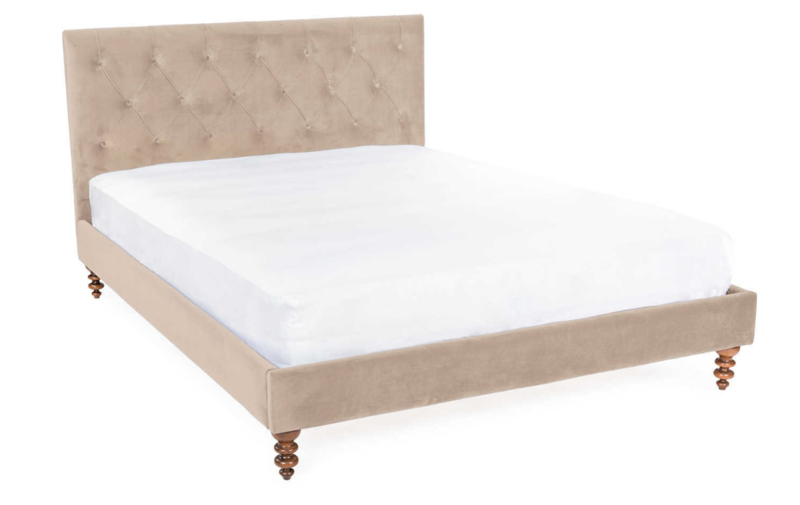 The Platform Bed starts at £849 here* – there are plenty of other minimalist sort of options to browse, including an upholstered one (yay!) in grey (yay!) with buttoning (woohoo! ).